The new and improved Kaze Master II fan controller features everything its predecessor did but with a few extra tricks up its sleeves. The Kaze Master II is the all-new fan controller priding itself with four new functions. Retractable control dials make it compatible with chassis which use a door at the front, Spin Up Voltage function ensures a stable run of the fan right from the start. A new safety feature is the Power Feed Control - a function stopping the power supply automatically after 15 seconds of no fan movement. The Kaze Master II even has an over-heat alarm function to be set individually by the user. The digital display for temperature and RPM has been revised too. 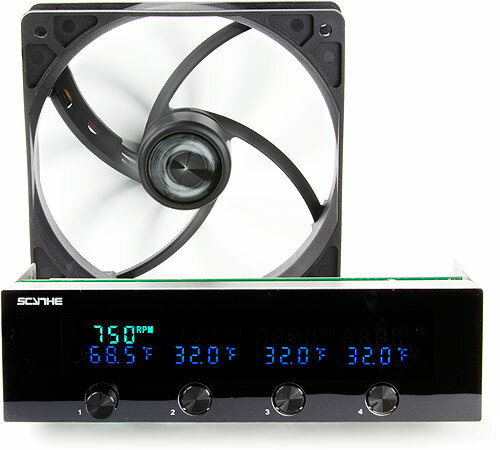 The Kaze Master II enables the user to control the temperature of their computer more precisely. The Kaze Master is designed to be installed into a 5.25" bay. As protruding control knobs would interfere with front doors of computer cases (preventing their closure), the Kaze Master II is equipped with retractable control knobs to make usage with such models possible. The LCD-display lets the user check both fan RPM and temperatures. It is also possible to choose between Celsius and Fahrenheit. The adjustable voltage range is between 3.7 to 12 volts. But as fans tend to have problems starting at lower ranges, this function ensures a 12 volt supply right from the start before settling down to the user's desired voltage setting. The Kaze Master offers a wide range of adjustable temperature settings for the alarm to sound. The user can choose between 55 - 90°C in steps of 5°C. If the Kaze Master II detects no fan movement for 15 seconds, for safety reasons the power to that channel will be cut automatically. Well made product which does what it says on the box. Not the easiest cables to handle around the inside of the case. You can end up with a bit of a spiders web if you are not careful. I am thinking of putting mine inside some nylon braiding.The provided tape to hold down the temperature sensors not much good.Better to us some clear repair tape from B and Q or similar. No serious complaints though. Very pleased. With an older MB and only 2 fan headers this is a handy device, particularly since my HD7950 has the Gelid Icy Vision cooler attached. Installing is as easy as you'd expect although I'd have preferred a SATA rather than Molex power hook up, SATA/Molex converters are OK, just a little untidy. Looks and feels like its been put together with a little care, good, solid build and the knobs 'push pull' is smooth as is their action, no loose, cheap feel. Issues: The power hook up, as already mentioned. The display is VERY clear, but it's set back from the unit, which makes reading it in a system on the floor or low down a matter of leaning/bending to see it clearly. Ellen Brook ve ekibine teşekküeler. Hızlı ve uygun fiyatlı kargo. Türkiyedeki arkadaşlar rahatlıkla alışveriş yapabilirsiniz. I've installed two of these so far, and I'm very happy with them. Not only you do away with lots of Molex adapters for a neater cabling layout, you also get to be able to optimise fan speeds based on actual temperatures - turn things down when idle, bring on the gale as needed when active. The installation was fairly straightforward, although it required a bit of fiddling with attaching cables to the head-unit as well (as opposed to the head-unit being packed with the cables already attached, as they do for some of their other controllers). I like that you can use it to turn all four fans completely off if you feel like it - that's excellent for figuring out where noise comes from, and what contribution it brings. I also like that the fan speed control knobs are retractable, for a nice, flush look. And best of all, I like that the manufacturer included two spare temperature sensors, recognising that some of them may be faulty - I've had to replace one of the standard numbered sensors. Unlike most fan controllers, this one really feels like a premium product. It's thick, built in metal and it weights like a 50 euro accessory. difference with the real temperature. Again, this all depends on how skilled you can be at placing them, without tucking them under heatsinks. Crucial for me is that the knobs can be recessed, so you can install the unit in a case with a door like the Fractal Design. Very few controllers are flat like this one. The knobs pop out or in by pressing them. The spring clicks elegantly and feels well built, like an expensive 70's HiFi system. My only complain is that the LCD numbers are recessed about 5mm from the actual surface of the screen, so you can't read them from a high angle. Which means, if your case sits on the floor, the numbers are hidden and you can't read them. Real shame, because the LCD display is of an extraordinary quality and it would read perfectly from any angle, if it was immediately below the screen surface. However, this controller is so superior to any other (I've tried a few already), that it's worth every penny. I'd recommend it.